With four ascending difficulty levels, these brainteasers are perfect for big kids and geeky grown-ups. The premise sounds simple enough: take the wooden particle apart and then try to rebuild it without sneaking a peek at the solution. But watch out, recognizing spatial relationships and spotting the solution is about as easy as seeing an atom, particle, cell or molecule with the naked eye! 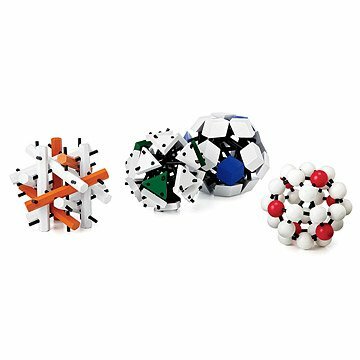 Each measuring six inches in diameter, these extra-large, science-inspired brainteasers for older kids or grown-ups will put your gray matter to good use. Each puzzle has a different concept and difficulty level. Once you've completed the Atom, the Molecule poses the next challenge, and then the Particle will stump you. Up for the ultimate challenge? You can tackle the Cell. And you thought passing chemistry was tough! Made in China. Click here to see Lab Test Games Solutions. They are all fun, but I did think they would be smaller. And they aren't easy, so you need to have someone who is willing to spend some time on the two hardest. Fun and useful!! Would recommend hand-washing to preserve great artwork. I'm married to the guy who solves EVERYTHING!!! He had a blast with this one! Engineering student has found it to be challenging and fun. Getting this puzzles was really exciting because it looked very challenging. Problem: I cannot take the puzzle apart and therefore cannot have the puzzling experience of putting it back together. Summary: - Pieces came out of the box with small cracks - Simply turning it over in my heads the ends have had paint start coming off - The sticks are 'glued' together by the paint used on the sticks - Company is not interested in trying to fix the underlying issue (though some of the reviews they do offer returns/replacements) Actions: - I have reviewed the instructions to verify that my understanding of how to take this puzzle apart is correct (reverse engineering it cause it only says how to put together but its that same idea, plus I also had a co-worker who got the cell and had no issues) - Reviewed the Asked Questions and Other Reviews: Seems like others had similar issues but got merely pointed to the solution file (its not a missunderstanding of how) as well as saw some people who had theirs break (which is why I don't want to use force to get the paint un-stuck, it already has cracks)... some reviewers got offered a new one but looking at reviews I'd think you would have a 50-50 chance of getting another one with the same issues. - Asked my own question, pleading for assistance with getting my puzzle apart (Come on, this shouldn't be the hard part of the puzzle). Despite the automatic reply about getting a response in a couple of days I have heard absolutely nothing in over two weeks. Advice To Other Shoppers: In my research I have found versions of this puzzle which are not painted but just plain wood. If you really want this puzzle then I'd buy one of those and maybe you can avoid some of the problems with this version (At least the paint issues... idk about the rest). I bought all 4 of these puzzles as a father's day gift. My husband and teenagers love 3D puzzles and collect them. We opened the 1st and it is so difficult, falls apart easily and has no understanding of how it it supposed to work. We have not opened the higher difficulty levels and will most like return them. Very disappointing. This was a gift for my son's birthday. He is 22 but has always been into gadgets, science, robotics, etc. He loved it! His face lit up when he opened the box, and it was fun to watch him explain what it was too everyone. A perfect unique gift idea, and great quality. Great Gift. My husband loved it. He has not figured it out yet. Once he has I will purchase another one.